Not a sell-out gig by any means as Jared Leto's Thirty Seconds to Mars played to a half-full O2 in Dublin last night. They were supported by Dara Quilty's Fox Avenue, and only played 17 tracks. Value for money? Definitely not. They could've filled a smaller venue like the Ambassador or Vicar Street at a cheaper cost. But then again, I suppose you have to pay big bucks for Hollywood "stars". 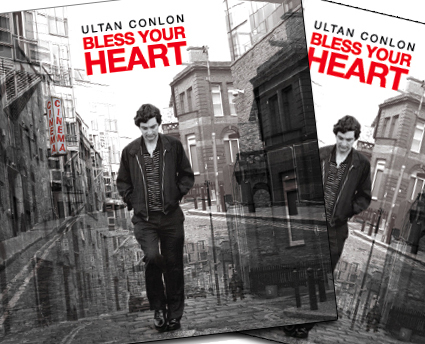 Ultan Conlon released his debut album Bless Your Heart recently, and the new single 'The Universe Tune' has just come out. The album and single are fantastic singer-songwriter stuff in the Ryan Adams/Neil Young/Bob Dylan mould. Ultan took some time out from his nationwide tour to discuss recording his debut album, his songwriting process, as well as playing live, and collaborating with legendary guitarist John Martyn. Let's start at the beginning: when did your musical heritage begin? I started playing guitar at the age of 11: A nun in the convent I went to taught a bunch of us after school, but I didn't really get into it until I was 14 when a neighbour at the time started to teach me Dire Straits and the like. I started writing shortly after. What were your early songs like? Still playing any of them now? In 2002 you recorded a live EP. At the time, did you always know you'd be a musician? No not at all, I was working at the time and really doubted myself about actually being a musician at all. It was only after John Martyn recorded 'Really Gone' in 2006 that I said to myself "ok, this is what I do and this is what I'm always gonna do". How did the John Marytn collaboration come about? At the time I played with a terrific singer songwriter from Galway called John Conneely in a Simon and Garfunkelesque Duo. We supported John Martyn on tour and he took a shine to that particular track and agreed to do some vocals on it. He pretty much made that version his own and thats how it all came about. It was a very exciting time for me. What did you learn from working with John Martyn? Did he have any advice for you? Sure, I had a bad habit of always singing on the kick and he advised me to swing my vocal, which over time I've taken on board. Sorry that probably means nothing to a lot of people, but it did help me record my own album. It was actually invaluable advice. What was it like recording your debut album, Bless Your Heart? Had you all the songs written before you went into the studio? I had lots of songs but they came from everywhere, some fast some slow so I think that could be harder than starting from scratch sometimes. I started to record some of the ones I knew were gonna go on there, and I also started writing some as we went along. We had the luxury, and sometimes the burden, of having the studio set up in the house we rented, so we were not under any pressure time wise. I just felt the album out over time, and there is a mixture of old and new songs on it, but I did try to make it feel like a complete piece of work. So how do you write songs? Do you have a particular process? Your current single is 'The Universe Tune', which has been very well received. Do you pay attention to reviews? I do at present because I'm starting out in many respects. I want to get this album and my songs to as many people as possible. I look on them as promotional tools I guess. The album and single have been well received by anyone who has reviewed it and I'm very pleased by that. Once they start slating me that's when I wont pay attention to reviews and tell you they don't matter. He, I'll justify it in some way! Speaking of reviews, how do you feel about being compared to people like Ryan Adams or Damien Rice? I don't mind in the slightest! Damien Rice made one of the finest albums ever in my opinion. If he never stepped back inside a studio he would have nothing to apologise for. O is timeless. Ryan Adams is just incredible when it comes to output. He seems to put out a couple of albums a year which is insane. I'd gladly take a leaf out of both books! Playing live is also a great way to get attention, you've got a few upcoming dates around the country. Do you enjoy playing live? I do and I don't. The thoughts of it sometimes scares me because I guess I feel like more of a writer than a natural performer, so it's taken me some time to get used to playing my songs in front of people. However, when you are up there and it's a good crowd and all is going well, it is the only place you can really find the emotion the song deserves. It can be a terrific high, just amazing feeling. I have this wonderful band and I can't wait to get gigging with them again. I guess Leonard Cohen would be one of my favourite artists. It's about the lyrics for me first and foremost, good diction and lyrics! If they are delivered with real emotion then vocal skills and musicianship can sit in the back. In saying that a beautiful melody is very, very important, and Leonard Cohen can certainly do that. I also like Van Morrison, Gram Parsons, Grant Lee Philips, Roy Orbison....anyone who pens a genuinely good song...It's all about the song! What's next for Ultan Conlon? What are your plans? Hmmm, Well in March I'll be all over Ireland, and April I'll be in the UK gigging so that will take priority. I'm writing and demoing songs in my free time so I'll try and take everything as it comes and just keep moving forward. The new Drive-By Truckers album is less than a month away. The Big To-Do comes out on March 16th on ATO Records, and to tease you as to its contents, I'm putting up downloads of all the available live recordings of the new songs. Click on the dates below the song names to download that particular version. Communion is a brand new UK record label founded by Ben Lovett of Mumford and Sons and Kevin Jones (Cherbourg, Marcus Foster) and is the home of some fantastic acts. To showcase this talent, they've produced the first ever Communion Compilation, containing 21 wonderful songs, including gems from Mumford and Sons, Matt Corby, Marcus Foster, Alessi's Ark, Jay Jay Pistolet, and Matthew & the Atlas. All this weekend, you can stream the entire thing on the Independent website. Two of the tracks from the compilation are also made available for download as mp3s, Alessi's Ark's 'Hands In The Sink' and Matthew & The Atlas' 'Deadwood'. Grab them, and have a listen to the full album stream via the link below. The music world, and particularly the Irish music scene, goes through phases. What happens is that a mega-band comes along and has a huge impact with their debut album (and sometimes the follow-up too), bringing with them a newish sound, as well as a whole fresh approach to things. In the 00s, the Strokes were one of these bands. After the release of Is This It, countless post-Strokes bands came on the scene, some even went for the same look. A lot of acts are taking queues from Vampire Weekend at the moment, and Two Door Cinema Club have definitely taken notice of that New York band's self-titled debut. Although formed in 2007, Two Door Cinema Club have a very "now" sound. Their music has nods to late 00s bands such as Bloc Party and Phoenix, and is all the better for it. Opening track 'Cigarettes in the Theatre' sounds like one of these VW-influenced songs, and at first you feel the album is going to be a sub-par attempt at deck-shoe chic. However, on track two 'Come Back Home' it all changes, and the album gets infinitely better from there. 'This is the Life' sounds staggering like one of the 00s' most underrated bands, Mumm-Ra. It is a stomping guitar-driven song with a marvellous hook and perhaps should be a future single. 'Do You Want It All?' was already released as the B-Side to 'Something Good Can Work', both featured here. 'Do You Want It All' has an addictive refrain which will seep into your conscious - you'll find yourself singing it at random intervals after days apart from the album. 'Something Good Can Wait' is Two Door Cinema Club's finest hour so far, and the centrepiece of Tourist History. The tripping-over-words vocals are extremely endearing, unlike the missed opportunity of 'I Can Talk' which tries to do much and never gets anywhere. 'Undercover Martyn' is the current single from the album, and an excellent choice. It has radio written all over it, and is better than a lot of the current dross being played, such as Owl City. 'Eat That Up, It's Good For You' sounds like it could be a Postal Service tune, and thus is the kind of thing that those Owl City fans should actually be lapping up instead of some dimwitted tune about fireflies and goodbyes. A lot of the songs sound like singles, 'What You Know' would definitely be a contender, were it not ruined by a horrible instrumental section. All in all, there's much more here to savour than not, making up for a fantastically accomplished debut album. They narrowly missed out on the final ten for BBC's Sound of 2010 poll, and on the basis of this, the Beeb missed an opportunity. Definitely ones to keep an eye on, and until they make their masterpiece: This'll do, Pig, this'll do. Founder of the Wallflowers Jakob Dylan will release his new solo album Women and Country on April 6th. If the title doesn't give the game away, the other members involved will. It's produced by T-Bone Burnett, and features guest appearances from Neko Case and Kelly Hogan on eight of the eleven tracks. "I'm so happy to be collaborating with Jakob at this exciting and vital time in his life as an artist," Burnett said, "I think this new album is an important work from a great musician." Hopefully it will be. It promises to be a great rootsy record, and should be more soulful than his debut solo effort Seeing Things. At the start of the year, Peter over at 2uibestow and myself listed the ten native acts to look out for in our Irish Sound of 2010. One of these acts, Oliver Cole will release his debut album We Albitri on March 26th. The album was recorded in Germany, and produced by Ciaran Bradshaw (Dark Room Notes, The Chapters, Subplots). In addition to that, it also has guest appearances from a Who's Who of Irish rock: Graham Hopkins (Halite/Boss Volenti), Paul Noonan (Bell X1), Nick Seymour (Crowded House), and Gavin Fox (Turn). To promote the record, he'll be playing the Sugar Club the following night, on March 27th. Tickets are on sale now, at a price of €13.50. It'll be a great chance to catch the former Turn-mainman before his solo career really takes off. 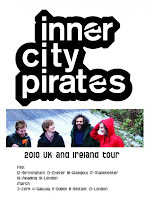 Innercity Pirates are an Irish-Welsh band, and are due to release their debut album Cutting Noses, Chasing Tales later this year. It's produced by Pedro Ferreira (The Darkness), and promises to be a great rock record. One of its singles 'Dedication', has already featured in a Guinness advert! To give you a sneak peak of what you may hear, the band's singer, Russell, has given me two of the tracks from the album as free mp3 downloads. I know many of us are trying to scrimp together the pennies to afford Oxegen tickets, so the best news about their Irish tour is that it's free entry! They'll be supported by the Laurel Collective on their entire UK & Ireland tour. Tickets cost a whopping €78 each, but you get a lot of bang for your buck. Here's the full list of acts playing on the night of the 16th of April. The Hold Steady (sans Franz Nicolay) will be releasing the follow up to Stay Positive on May 4th. It's called Heaven is Whenever, and is a "much more dynamic record than anything they've done". Guitarist Tad Kubler also had the following to say about the album "This album is sonically more diverse. And I really believe it exposes new elements of the band that we hinted at on other records but weren't able to fully realize until this one. Rather than just concentrate on changes in instrumentation, we made changes to the song writing process. And this helped everyone to experiment not only with their own instrument and where they should play, but where they shouldn't. This record doesn't feel as dense. It feels more spacial. We weren't trying to get a dozen different ideas on a song." Frontman Craig Finn added: "The lyrics speak a lot about struggle and reward. Its about embracing suffering and understanding its place in a joyful life. I think that some of the characters from old records are there, but I don't name them by name. I think it continues to examine the highs and lows that we've looked at on previous records." Ain't No Grave is the last ever release in the American Recordings series, and came out at the weekend ahead of Johnny Cash's 78th birthday on Friday. It was recorded during the same sessions that brought American V: A Hundred Highways, just after the recording of the stellar American IV: The Man Comes Around. Obviously, it doesn't reach the heights of the third or fourth instalments of the Rick Rubin era, but it is just as good as number five. There aren't any of those inspired covers such as 'Hurt' or 'Solitary Man', but the entire contents of this album speak for themselves. All the songs are understated in a way only Johnny Cash could make them. The title track, and opener, 'Ain't No Grave' is a traditional tune, and features the Avett Brothers as backing musicians. It's a solemn tune, and a fine opener. Sheryl Crow's 'Redemption Day' is one of the more contemporary songs on the album, and is a fine choice. However, it is fellow veteran country-singer Kris Kristofferson's 'For the Good Times' that is the album's highpoint. It's a gorgeous pop song, which had been earlier covered by Elvis, but I think the man in black's version may be the best I've heard it. The lyrics are added so much weight given Cash's own condition - how his wife June Carter died just months before him in 2003. At the moment it's the last ever song Cash wrote (there may be others released in future, you know what the marketing machine is like), but 'First Corinthians 15:55' is up there with many of his later-years self-penned tracks. It's better than 'I Came to Believe' from American V, but not as good as 'Like the 309' from the same sessions. Cash was very religious, and this is another grand addition to his legacy. Johnny Cash's take on Red Hayes and Jack Rhodes' 'A Satisfied Mind' originally appeared on the Kill Bill 2 soundtrack, but is more than worthy of inclusion here, as it joins a fantastic canon of cover versions of the song - alongside The Byrds, Glen Campbell, Jeff Buckley, Lucinda Williams, Daniel O'Donnell, and even Roseanne Cash. 'I Don't Hurt Anymore' is a perfect post-breakup song, and when Cash sings "No use to deny I wanted to die / The day you said we were through / But now that I find you're out of my mind / I can't believe that it's true" you know he means it. 'Cool Water' is the only real low point on the album, as it never really gets going. I also think that 'Last Night I Had the Strangest Dream' should have been the closing song rather than 'Aloha Oe', as it would be a fantastic finale to the American Recordings series. Many people may dismiss this album as mere moneymaking (like how Tupac has so much posthumous material), but that would be an injustice. At the time they were recorded, these songs were always meant to be heard, and thus it's a fine end to a wonderful series. If you have the rest of the latter-day Cash albums in your collection, this is a must-have. I was at the super-special launch of Oxegen 2010 earlier today at the Academy (thus why I'm late getting around to posting about it), and my head is still trying to cope with the sheer deluge of acts announced. If you follow my twitter feed, you would have seen my many comments earlier today, but my main concern is where the hell are all the Irish acts? Just one on the lineup so far: Northern newcomers Two Door Cinema Club. Kasabian are headlining Oxegen's Scottish sister T in the Park, but the three headliners for our own gig are Eminem, Muse, and Jay-Z. Tickets go back on sale on Friday March 12th, and 3 day camping ones cost €224.50. There's sure to be more acts announced, as well as info on who'll be playing Friday, Saturday, and Sunday 9th-11th of July 2010. The first concert for the renamed Lansdowne Road has been announced. Canadian crooner Michael Bublé will be playing the newly opened Aviva Stadium on Friday, September 24th. It'll make a nice change from all the football and rugby which will showcase the arena's reopening. It will be a fully seated concert, and tickets priced €65.70 go on sale this Friday at 9. Tickets could sell out quickly, as his last album is still #1, and has gone nine times platinum in Ireland. The new Broken Social Scene album, Forgiveness Rock Record, will be released on May 4th. It'll be out on Arts& Crafts in the US, and will be out May 1st in Ireland. Hopefully it's every bit as good as the classic You Forgot It In People. They're giving away one of the album's tracks, 'World Sick' for the price of an email address - just fill it in below. Ohian Joshua Radin, who shot to fame with the help of TV shows like Scrubs and Grey's Anatomy, will be playing Dublin's Academy on April 26th. Tickets for the show cost €19.50 and are on sale now. Lady Gaga played a great varied set at Dublin's O2 last night, for her first Irish appearance of 2010. She played songs from both The Fame and The Fame Monster as well as a few extra ditties.